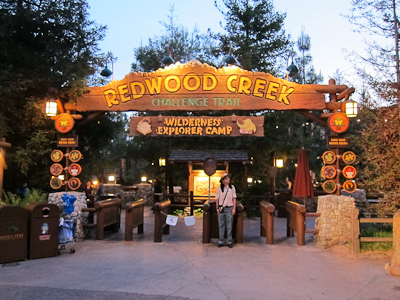 Back over to the Mouse-Next-Door, there’s an attraction I particularly love–the Redwood Creek Wilderness Explorer Camp. 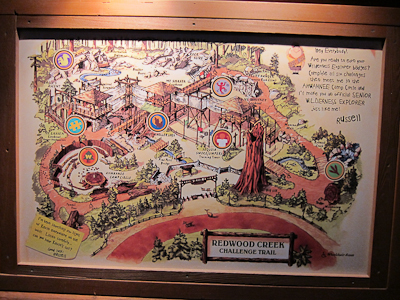 The Redwood Creek Challenge Trail is sort of tucked away in this little area of California Adventure, and is a great place to just immerse yourself in a truly interactive attraction. It was originally tied to the movie Brother Bear, which I never saw, but is now themed in with the Pixar movie Up, which I love, love, love (SQUIRREL!). 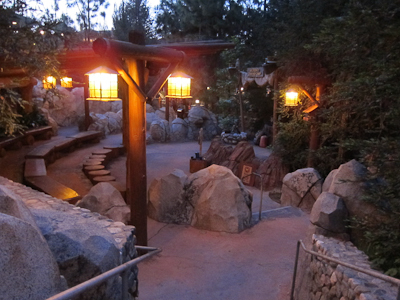 Part of the challenge trail is walking in the footsteps of Russell (the Boy Scout-like character in Up). 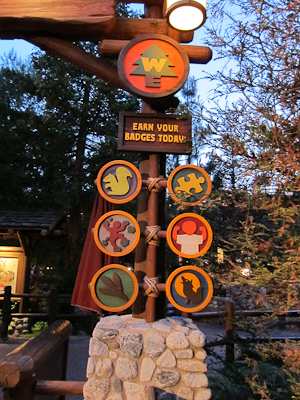 You can move through the trail collecting Wilderness Explorer patches. 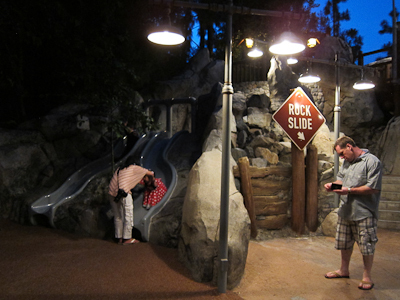 While you slide down giant slides that look like tree trunks. At the bottom. We had to do this approximately 5,000,000,000 times that night. How sliding down tree trunks is connected to wolf howling is a little beyond me, but it’s fun. Theo particularly loved this part. 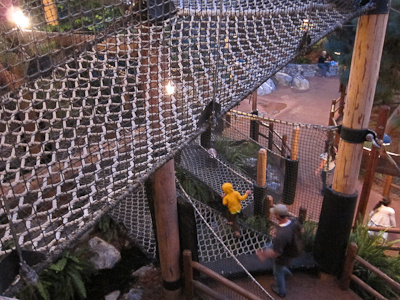 The area is defined by a number of activities, from the slides to a kid’s zip line to just a whole lot of rope bridges. 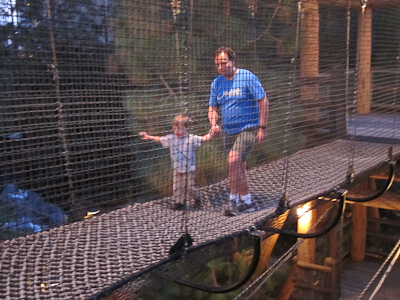 For a while Theo was too anxious to walk on the ropes, but he got over it. 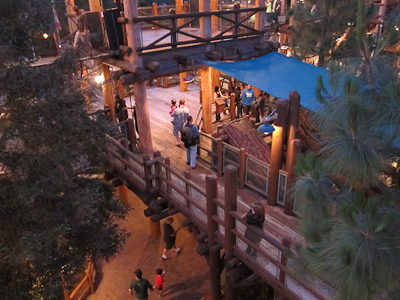 The whole trail is multi-level, so it’s fun to see the different vantage points. After you’ve finished your Wilderness Explorer badge hunt, there’s a small theater where you can watch a graduation type show. 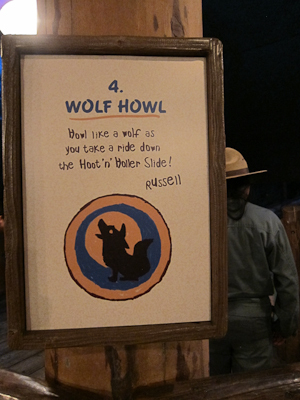 At the show you take your official Wilderness Explorer Oath, call for Kevin the bird thing, get a Wilderness Explorer sticker, and do a meet and greet with Russell from the movie. Unless you find Russell positively terrifying, which Theo does. There are also other things to do. 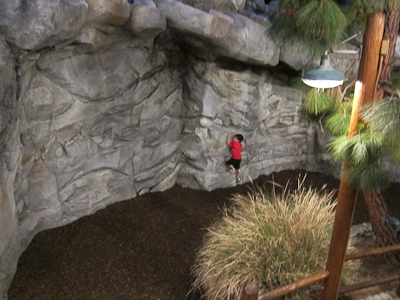 A little kid zipline on tires is super cool. In a princess dress, no less! Unfortunately I am too big for this, so chalk that right up with the Jedi Training Academy as things I wish I could do but can’t. 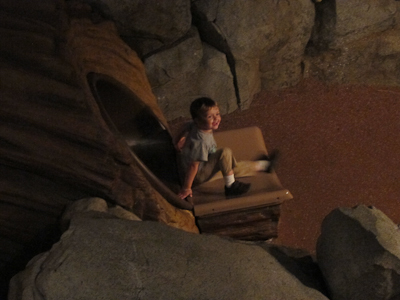 There’s also a smaller slide, which Theo didn’t like quite as much. 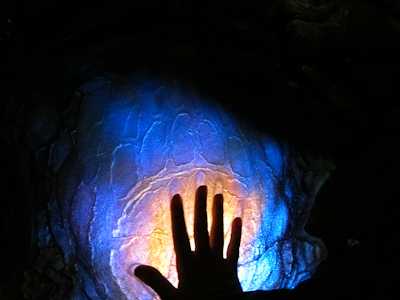 And left over from the Brother Bear theme, a cave of wonders with these hand thingies that light up and tell you your spirit animal. My spirit animal is apparently a skunk, which to be completely honest is pretty disappointing. 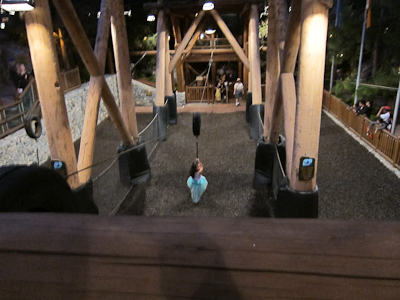 The Redwood Creek trail is really great if you’ve got kids who need to blow off some energy after waiting all day, and fun for adults as well. It’s sort of one of those hidden treats at the Mouse-Next-Door, and I do recommend it. 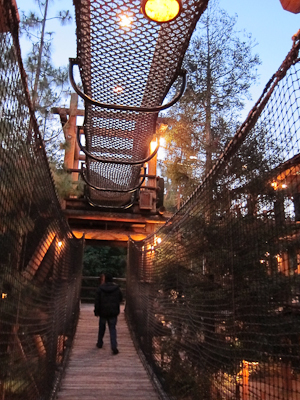 When it first opened, there was no height or age restriction for the zip line thing. It was fun! 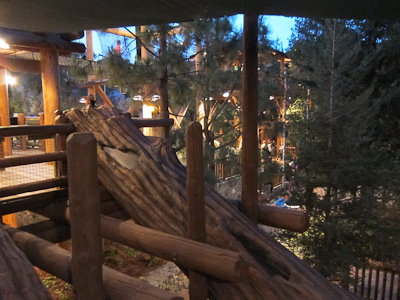 Love the Wilderness Explorer Camp – especially when there are long lines everywhere else! Tim said there used to be a Native American show there a few years ago. He theorized they got rid of it because it was PC…. Sorry about that spirit animal thing. That really stinks. We like to take our daughter there while we rider swap GRR.